See Result inspection section in documentation. PVQT 2.0 FREE licenses for BETA testing: Get now! PVQT is a tool, developed by MSU Graphics & Media Lab. Video Group for evaluating of subjective quality (with reference or without one) of a video and image files. The tool was developed according to ITU-R BT.500 “Methodology for the subjective assessment of the quality of television pictures”. The program does not exactly repeat the standard, as it is focused on the measurement of quality for television, but PVQT is aimed for quality measure of digital materials. Also, it has some additional features not described in the standard. Player (MSU PVQT Player) — for performing (playing) test by observer or operator in case of Network test (see section Passing a test in Documentation). To create PVQT test you need one or more groups of source files. The source files can be videos or images: PVQT supports all basic video and image formats. Each group consists of different versions of one picture, which will be compared with another picture of that group. Group can have a reference. In that case all pictures will be compared to the reference. 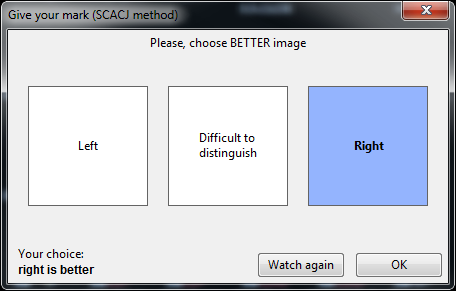 Without reference there can be pairwise comparison with SCACJ method. ITU-R BT.500 recommends videos to be at most 10 s length. In case of images, you can tune duration that the image displays. Whole test should be no longer 30 m including voting, training questions and period between videos. You can have several sessions with breaks, each for 30 minutes. See ITU-R BT.500 for details. DSIS — Double Stimulus Impairment Scale Videos are shown consequently in pairs: first video is the reference (observer is informed about it), second video is an impaired. 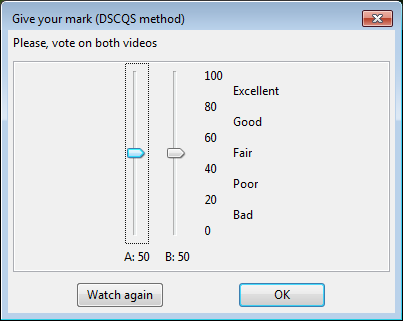 DSCQS I — Double Stimulus Continuous Quality Scale Type I In one playback window observer is free to switch between two videos. One of videos is the reference one, but an observer is not informed about it. 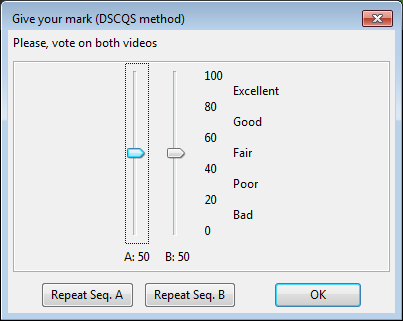 DSCQS II — Double Stimulus Continuous Quality Scale Type II Videos are played simultaneously (side-by-side) a given amount of times (repetitions), one is the reference one, but an observer is not informed about it. 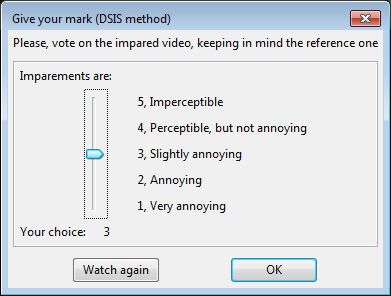 Two videos are shown simultaneously, after playback observer is asked about his opinion. You do not need to have references for this test. Pairwise results will be processed according to Bradley-Terry model. 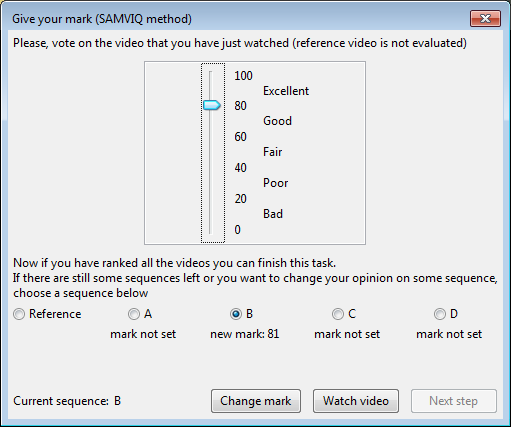 SAMVIQ — Subjective Assessment Method for Video Quality evaluation Observer is able to play any sequence from the test set and give it mark, plus observer is able to play reference video. Single computer testing All observers pass a test on the same computer. No additional preparations are needed. It can be the computer on which test was created, or project correctly transmitted to another computer. We recommend install PVQT player (or full PVQT) to that computer and run test from Windows Explorer. In this method, the test can be run by an arbitrary number of observers simultaneously or not on computers on the same local network, for example, in a computer class. The test manager can view the results in real time. Edit and save project to location available to another computers via shared folder. You should use “Relative paths” and all videos should be also available via same shared folder or be referred in project by network path. Multiple observers can pass test simultaneously (for example, in computer class). If Editor for this project file is opened you can see progress and results of each observer in Real-time. Also, it will display overall progress in summary. In this method, you are sending test and videos to observers, located anywhere, who will pass the test at any time. After test is complete, observers will send you back results of testing. To use this method, specify email in field “Result collecting e-mail”. After test is finished, observer will be asked to send a special archive (*.pvqtres) file to that email. After you collect some archives from observers, you can import them into PVQT using “Import results from *.pvqtres file” command (project should be saved). You can import multiple files at once. This method will be implemented in the next version of PVQT. You choose to show the video on a large screen, for example, through a projector that is viewed by several observers. Each of them votes on their device.